There’s nothing like a spring day to clear the little gray cells and let the imagination wander. In fact, a spring day in 1951 in Washington, DC, helped lead to the development of the laser. 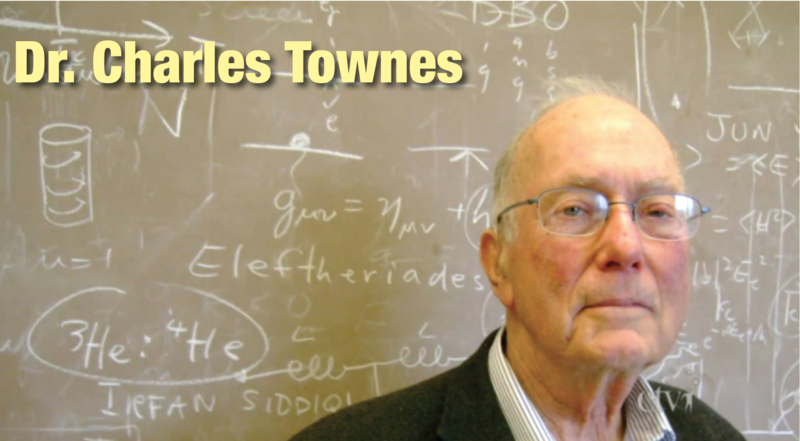 Charles Townes was a physicist at Columbia University. He’d been trying to develop powerful beams of radiation, but he wasn’t having any luck. But as Townes recalled last year in this interview from the University of California, after a meeting in DC, it came to him. TOWNES: I thought about it and I thought about it, and I sat on a bench in a park. Oh, hey! I got an idea — this is the way to do it. I think it’ll probably work. I went home, and it took me a long time to get it done…. Townes and his students developed that insight into the maser — TOWNES: Maser is microwave amplification by stimulated emission of radiation — a device that creates a beam of microwaves of the same wavelength that all move in step, like soldiers marching in review. Later, Townes and others extended the technique with beams of visible light, creating the laser. His work earned Townes a share of the 1964 Nobel Prize for physics. Townes was born 100 years ago today in South Carolina, and passed away earlier this year. During his long career, he helped develop radar bombing systems for the military and probed the workings of molecules. He advised NASA on the science of the Apollo Moon landings, and the Reagan Administration on a missile system. And he used his creations to study the universe. This entry was posted in In Memoriam, research. Bookmark the permalink.